Aside from my imaginary French Patisserie, I also run an imaginary Bed & Breakfast where I treat myself like a guest in my own home and let myself wake up to something indulgent. 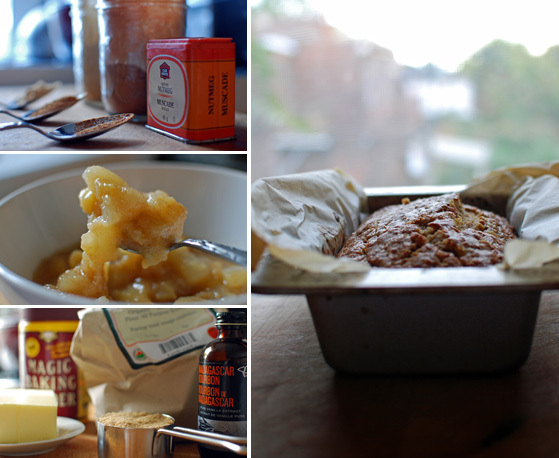 There is nothing quite as nurturing or sensual as taking the time to get up early and whipping together a spiced pear loaf, crawling back to bed while it bakes, and drifting awake to the scent of cinnamon, nutmeg and ginger. This is a breakfast-in-bed treat for eating in your robe, where crumbs fall happily past the folds to encourage a loosening of ties and a stolen moment of warm sunlight on bare skin. 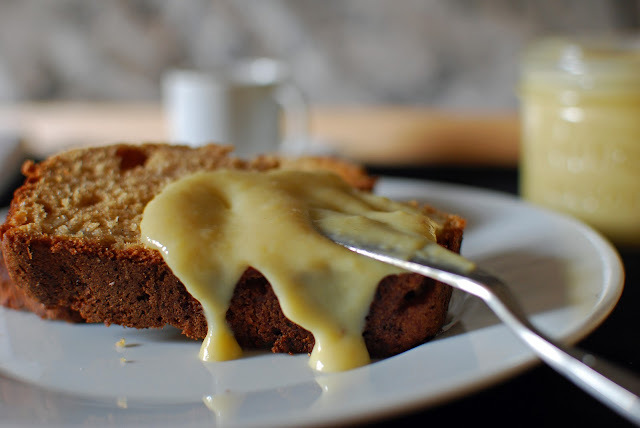 Pears slightly past their prime are transformed into a spiced sauce that moistens the cake as well as a creamy, silky curd to spread on top (of the cake and whatever else you fancy). Often the best dishes come from the furthest, forgotten corners of pantry and fridge. This week, my crisper housed a few overripe pears in need of a sweeter home. The pears were firm and smooth at one point, but last week I got culinarily distracted by some fresh apples that came my way. The apples flirted themselves right into an Apple Flognarde, leaving the abandoned pears to be battered and bruised by the rotating produce that came in and out of the crisper all week. I decided to make it up to the pears by treating their now soft and tender bodies to a dessert that would celebrate their rediscovery. For the loaf, I reunited long-time lovers: cinnamon, ginger, and nutmeg. 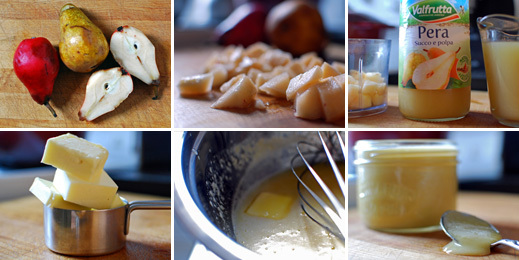 I peeled and diced three of the pears so they could simmer in the spices and get fully acquainted. The stewed pears and spices then met with a buttery batter to form a perfectly rustic, sugar-crackled loaf. The juices of overripe fruit are perfect for transforming into curd. 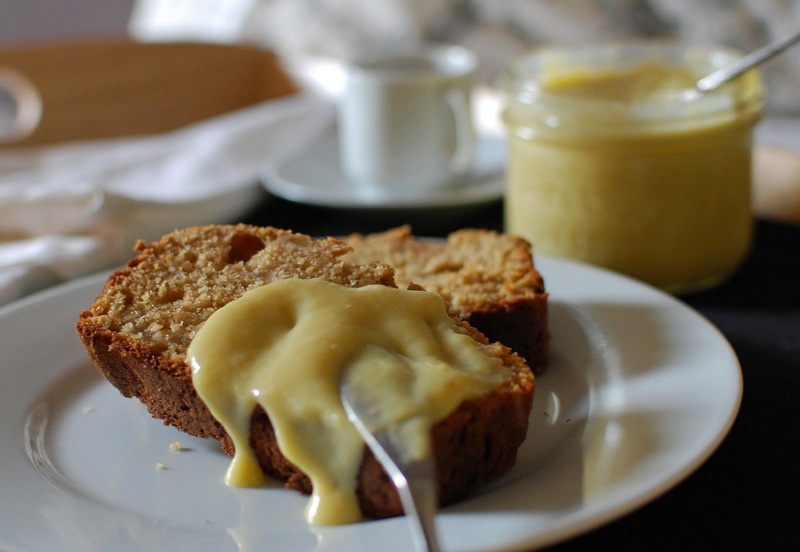 The pear flesh and pear juice are pureed and whisked with egg yolks and sugar over a double-boiler. Chunks of butter are fed one by one into the mixture, melting on contact, to form a silky-smooth, spreadable sauce that truly carries the essence of pear in each spoonful. Since I run my own virtual Bed & Breakfast, 'breakfast' is available any time of day and clothes and additional guests are optional. Good coffee is a given, as is the proprietary right of licking the spoon for the curd. From the comfort of one's boudoir (the kitchen or the bedroom kind), one can, through cake and curd, enjoy the sweetly fragrant and tenderly spiced experience of pear on pear. 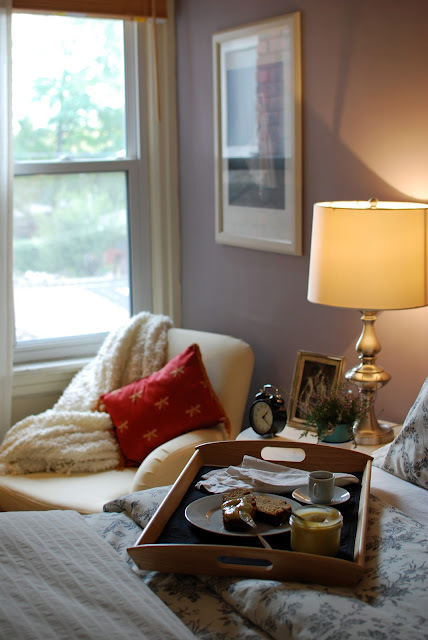 From my vantage point amidst propped pillows and soft sheets, the combination is so intoxicatingly sultry, if I described it any more, this blog would have to be wrapped in brown paper. Using electric beaters, or a mixer with the paddle attachment, cream together butter and sugar until fluffy. Add eggs, one at a time, mixing to fully incorporate before adding the next. Add vanilla. In a separate bowl, combine flour, baking powder, baking soda, salt, and spices. Add to butter/sugar mixture along with the stewed pears and milk. Mix until just combined. Pour into parchment-lined loaf pan, sprinkle the top with demerara sugar, and bake at 350 F for 30-40 minutes until the top is golden and a toothpick inserted into the centre of the loaf comes out clean. 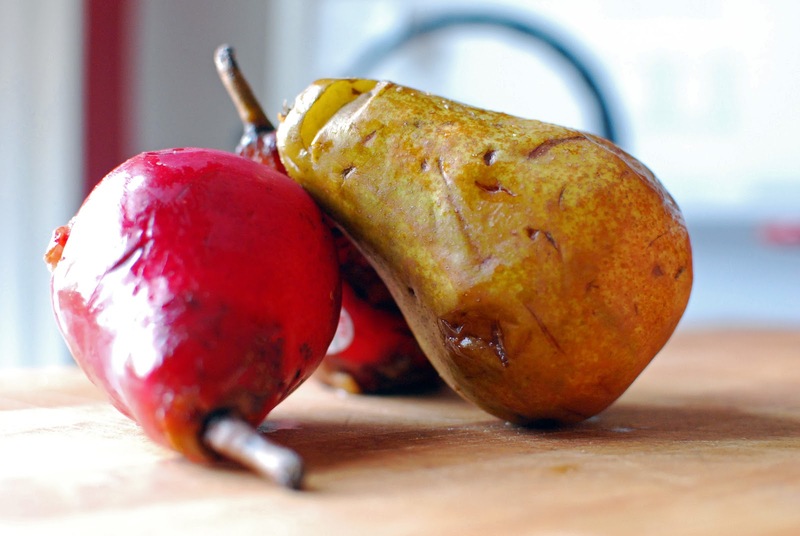 Peel, core, and dice the pear and puree with the pear juice in a blender or food processor until smooth. In a metal bowl over a bowl of simmering water, combine pear puree, egg yolks and sugar. Whisk constantly. Add butter, a tablespoon at a time and continue whisking, letting each knob of butter melt and incorporate completely before adding the next. Continue whisking until mixture lightly coats the back of a spoon. Add corn starch and whisk quickly to ensure there are no lumps. The curd is done when the mixture thickly coats the back of a spoon. Allow to cool and refrigerate to set further. Keep refrigerated and serve with this Spiced Pear Breakfast Bread, or the baked good of your choice - it will last about one week in the fridge. Fantastic breakfast. What a great combination of flavours and textures! The best part of this breakfast bread? It magically makes it 'breakfast' any time of day! Oh. Em. Gee. I would stay at your imaginary B & B and patisserie in a heartbeat! Waking up to a breakfast like this would be awesome! So when's the opening? By the way, I read your comment about your El Camino trip! So excited for you - something to look forward to come Spring time. I'm so envious of your upcoming trip!!! Ahhhh....! I've just put a key with your name on it at the 'front desk', Jen. :) Since it's imaginary, feel free to retreat there anytime. I do. I am definitely looking forward to my trip - it's been a dream of mine for at least 6 years now. First heard about it through a violinist who made the trip - Oliver Schroer. If you want to retreat on an 'imaginary Camino' - play his song "Field of Stars" on YouTube. He brought his violin with him on the walk and played in cathedrals and along the path - improvising musically how he felt within. It's breathtaking. I have pear trees in my orchard and these recipes are most welcomed. Oh, to have an orchard! I'm glad you like the recipes, Karen. Your house is beautiful and I enjoyed traveling Bavaria through your photos.